Travelling for work is a whole lot nicer when you have an excuse to stop and smell the roses. Mike Peake meets Tom Hart Dyke, the professional plant hunter. If ever you find yourself staring wide-eyed at a breathtaking vista and suddenly notice a cheery Brit facing the opposite direction with a trowel in his hand, say, “Hello Tom!” and prepare yourself for an ear-bending. But in a good way. Tom Hart Dyke is a plant-mad globetrotter, as passionate about leafy things as the average Brit is about beer, and there’s no one else on earth who could entertain you so eloquently – or animatedly – on the subject of botany. Even if it does get him into serious trouble from time to time. On the hunt for rare flowers in southern Panama in March 2000, Tom and a fellow backpacker found themselves kidnapped at gunpoint and threatened with execution. Miles from civilisation in the lawless Darién Gap, which separates Panama and Colombia, Tom thought his number was up. It was a feeling that rarely left him during the next nine months he was in captivity. 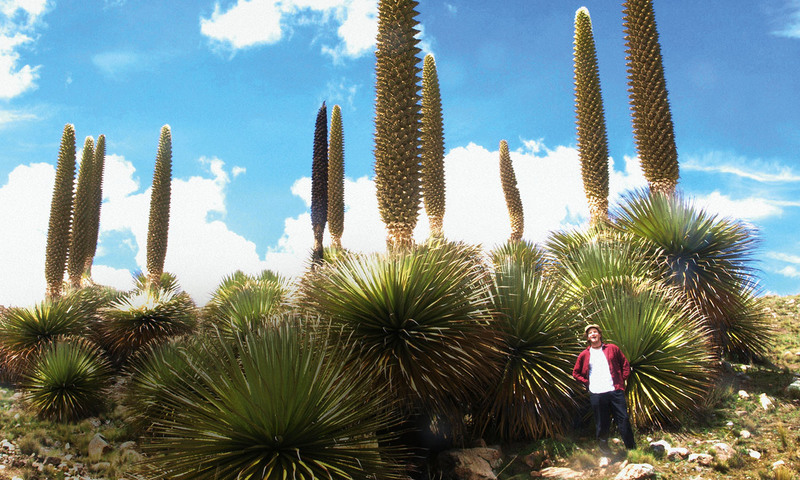 Tom Hart Dyke is dwarfed by giant puya raimondii in Peru. On 16 June, three months into his captivity, Tom was told he had five hours to live. With shaking hands he reached for his diary and started sketching out a plan for a botanical gardens shaped like a map of the world and featuring plants from every continent. More than that, it provided Tom with a grand plan that, once he was released, has kept him occupied ever since. With more than 8000 species, Tom’s ‘World Garden’ in Kent – which is open to the public – is one of the largest private collections in Europe. And getting the plants has been half the fun. Tom first got his hands dirty when he was just three, after his grandmother gave him a packet of carrot seeds and pointed him at some soil. Growing up in the lovely surrounds of historic Lullingstone Castle – the 650-year-old Hart Dyke family seat – Tom found gardening was just the hobby for an outdoor-loving nipper with acres of land at his disposal, and it wasn’t long before he noticed the myriad plants dotting the Kent countryside around his home. Tom’s real love is orchids – the delicate, extravagantly flowered, almost mythical flora that have kept plant hunters in a state of nirvana for centuries – and surprisingly, they were to be found in abundance in his own neighbourhood. But what if we don’t like flowers?